A basic understanding of React is needed to follow this tutorial. In this tutorial we'll be building a location-sharing app with React Native and Pusher. By reading this tutorial, you will learn how to use the geolocation functionality in React Native, and broadcast the geolocation data with Pusher. You will also learn how to integrate Facebook login into the app. React Native development environment - if you don’t have a machine setup for React Native development, be sure to check out the official docs on how to get started. Genymotion Emulator - this is used for testing the app later on. You can actually use your Android smartphone as well, but Genymotion really makes it easy to test geolocation using their GPS emulator. Pusher app - you’ll need to create a Pusher account in order to use Pusher’s services. A Pusher account is free to create and it even provides you with ample resources for testing the service. Once you have an account, create an app which will be used for connecting to Pusher. Facebook app - this is required because we’ll be using Facebook login for the app. 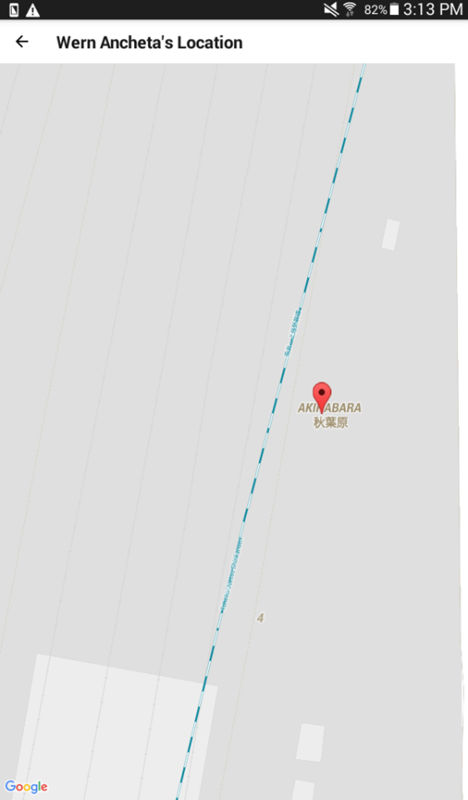 Google project - this is required because Google Maps is used for the map display. In the following sections, I’ll be showing you how to create the Pusher, Facebook, and Google project. Once you’re logged in to your Pusher account, go to your Dashboard and look for the menu for creating a new app. Set the name of the app to “locSharer”, and select the cluster nearest to your location. Click on the Create my app button to create the app. Once the app is created, click on the App Settings tab and enable Client Events. We need this because we’ll be sending events directly from the app. After that, click on the App Keys tab and copy the credentials somewhere where you can easily access it later on. We’ll be needing it later once we start configuring the app. The command above generates a 28-character key hash. Paste the value under the Key Hashes field and save the changes. This step ensures the authenticity of the interactions between your app and Facebook, thus it’s a required step even for the development environment. You can find more information about this on the Facebook login documentation for Android. The command above allows you to get the sha1 hash. Look for it, copy the corresponding value and paste it under the SHA-1 certificate fingerprint field. Also enter the package name of the app (com.locsharer) then save the changes. Just like every other Pusher app integration, this app needs a server component as well. The server’s job is to authenticate the requests coming from the app. This allows us to make sure that the request is indeed coming from the app and not anywhere else. Start by creating a new folder for the server-related files. Inside the folder, run npm init to initialize a new project. Simply press enter until it asks you to confirm the project details. Once you get to that, just respond with yes. Next, add the code for connecting to Pusher. The Pusher app credentials are being loaded as environment variables. As you have seen from the code below, we’re not really using a module for loading environment variables from a .env file. Later I’ll show you how the values are being supplied. 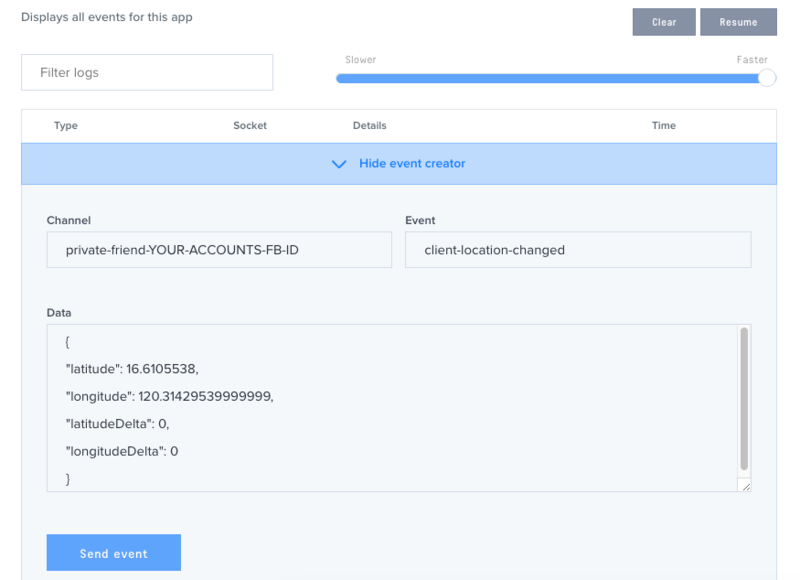 Add the code for authenticating users that are connecting to your Pusher app. This contains the unique key that we will use later on to check whether the request has indeed come from the app. Once installed, you can now add your Pusher app credentials as a secret. One caveat of Now is that all the files for the deployed projects are available publicly. This means that the values in the .env files are publicly available as well. Adding those values as a secret means that it won’t be accessible anywhere. Don’t forget to replace the values with your actual Pusher app credentials. What the command above does is deploy the server, as well as setting the environment variables using the -e option. The secret values that you’ve added earlier are accessed by using the @ sign. When the process is completed, it should return a URL pointing to the server. Access that in the browser to check whether the server is running or not. prop-types - for specifying the intended types of properties passed to components. pusher-js - for interacting with Pusher. 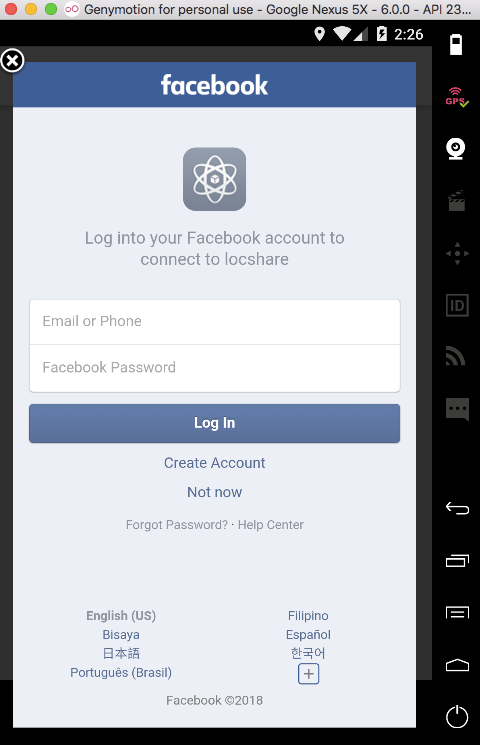 react-native-facebook-login - for implementing Facebook login. react-native-maps - for displaying Google Maps and markers. react-navigation - for implementing Stack navigation within the app. Additional steps are required in order for Facebook login and Google Maps to work. We’ll look at how to do that in the sections to follow. The following steps assumes that you have already created a Facebook app. So create one, if you haven’t done so already. The following steps assumes that you have already created a Google project, and generated an API key. The code above uses the React Navigation library to create a StackNavigator. This allows the app to transition from one screen to another by placing the new screen on top of the stack. This allows us to easily implement the back functionality since all it has to do is to “pop” the current screen out of the stack in order to go back to the previous screen. To use the StackNavigator, pass in the components to be used as the individual pages. The first one is the initial screen of the app. Next, we need a way to unsubscribe from a friend’s channel when the current user is no longer viewing their location on a map. That happens when the user goes back from the map page to the index page. The React Navigation library doesn’t really provide a way to listen for the event when the back button is tapped. That’s why we need a way to emulate that behavior. I’ll let you figure out your own solution. So feel free to skip the following paragraph if you want. The code above is pretty self-explanatory so I won’t go into details what each line does. This function is used for getting the latitude and longitude delta values needed by the React Native Maps library to display a map. When the user taps on the back button, componentWillUnmount() is triggered as the component goes out of view. So this is the perfect time to trigger the unsubscribe event to let the index page know that the user has stopped viewing their friends location. You only need one device and one emulator in order to test the app. First, run the app on your device by executing react-native run-android. Once the app is running, disconnect the device and open a Genymotion virtual device. Execute the same command again to run the app on the virtual device. Don’t forget to add another Facebook user, aside from your own Facebook account as a tester or developer under the Facebook app settings. You can do that by clicking on the Roles tab and searching for the user in there. Only Facebook users that are added in the app settings can login. This is because the Facebook app is still unpublished. Genymotion has a built-in functionality for spoofing the GPS coordinates. This will trigger the geolocation functionality in the app everytime the location changes (either by pointing the marker on a different location on the map or searching for another place). That’s why it’s best to use Genymotion for testing the user who is broadcasting their location. If you’re going to follow this route, be sure to check out the documentation on how to install Google Services on Genymotion since the Google Map functionality uses Google Services. Send the event once that’s done. Sending the event should update the map on the app. You can use a service such as latlong.net to come up with the coordinates of different places. The number of friends that are currently viewing the user’s location doesn’t actually get updated when someone disconnects from the user’s channel. You can add a listener for when someone disconnects, so that you can update the value as well. The current user doesn’t actually know who are the people that are currently subscribed to their location. For this you can use an alert dialog everytime someone subscribes to the channel. The client-friend-subscribed event has already been laid out for this purpose. You can even take the idea further by making use of Presence channels. This comes with an additional feature that allows you to keep track of the people that are subscribed to a specific channel. Add notifications to inform the subscribed users for when the user they’re subscribed to disables location sharing. That’s it! 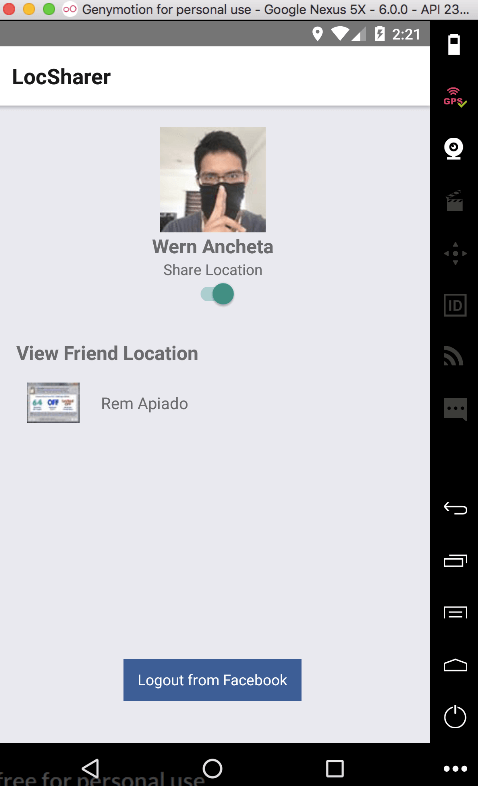 In this tutorial you’ve learned how to create a location-sharing app which uses React Native’s built-in Geolocation library and Pusher to broadcast the data to the user’s friends.